The History group meetings have been suspended until further notice. A copy of the Curates License of 1880, provided by Mavis Jeffery. A contract for the Church Caretaker 1919, supplied by Mavis Jeffery. Pages taken from the book The Parish Churches of Leicestershire (Vol 2) by Andre Swift, detailing his record of St. Mary Magdalene Church, Shearsby. A newspaper article about John and Jane Ball, the highwaymen that used to operate in the Shearsby parish. No identity as to the Newspaper or date of the article. An article in the Leicester Advertiser dated 31st December 1976 and showing some of the Shearsby landmarks. An article from The Leicester Mercury about the Shearsby Festival in 1972. A newspaper article about irate farmers from Shearsby demanding a closure of the ends of the old road to stop itinerants. A news article headed by the Leicester Records Office with a brief history of Cobblestones and the Church, provided by Mavis Jeffery. Newspaper article entitled A Portrait of Shearsby, dated 1981. The photo of the hunt is when the Fernie Hunt met at Grange Farm in 1929.
right and Ivy Gadsby with the glasses second from the left. the right on the back row and Ivy Gadsby with the glasses on in the front row. The last two photos are dated 1935. A history blog about Shearsby, compiled by Phil Adams, February 2017. Shearsby Village History (Past and Present), edited by R. Southerton. 1972. A document tracking the origin and changes to the name of Shearsby. A history of the village green written by Mrs. Nora Burton, February 2017. Historic Environment records provided by Your Locale as part of our Neighbourhood Development Plan. An updated history of Yeoman's Cottage in Church Lane. A map of Shearsby showing field names. Compiled by Mrs. Mavis Jeffery. A history of Tigh Rhu, a house on Mill Lane, Shearsby, by Philip Adams. A selection of history notes taken from the web about Knaptoft. The story of John and Jane Ball, the infamous highwaymen of Shearsby. A 1960's newspaper article about Harry Dudgeon's heirloom, provided by Mavis Jeffery. An item from the internet site for the Howcutt family citing a link to Yeomans cottage in Shearsby. A record of the Shearsby Charity dated 1837, provided by Nigel Walker. 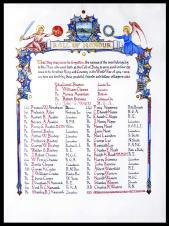 A scroll to be found in St Mary Magdalene Church listing those men from Shearsby Parish that served in World War I. Four men from the village died in action and we honour them. 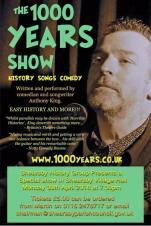 A poster advertising the 1000 Years Show to be held on Monday 30th April at 7.30pm in the village hall. Minutes of the History Group meeting held on 30th April 2018. Minutes of the History Group meeting held on 26th March 2018. Minutes of the History Group meeting held on 29th January 2018. Minutes of the History Group meeting held on 31st July 2017. Minutes of the History Group meeting held on 26th June 2017. Minutes of the History Group meeting held on 29th May 2017. Minutes of the History Group meeting held on 24th April 2017, held at the home of Sue Timms. Minutes of the History Group meeting held on 27th March 2017. Minutes of the History Group meeting held on 19th September 2016. Minutes of the history group meeting held on 29th February 2016. Minutes of the Shearsby History Group meeting on 25th May 2015. Minutes of the first Shearsby History Group meeting on 23rd February 2015.